My first word of advice: I arrived early to see Ryan Adams, and wound up wondering why I did. This opening act is no Pretenders or Sheryl Crow. Remain in your hotel and have another drink instead! Maybe because it was now 2003, maybe because the best show on the No Security tour was here, I was expecting very much from the Stones tonight. We got a good performance, but nothing unusual or spectacular. There was a definite Let It Bleed theme, with the title track played on the big stage with the traffic jam background usually associated with Sweet Virginia in past shows. Monkey Man and Midnight Rambler were also part of the package. The best part of the show came in the form of a leisurely Can�t You Hear Me Knocking, with Ronnie coming through with a spectacular solo, provoking the rest of the band in a way which only Keith used to do. It was really fun to see Ronnie get everyone else going. Small stage security seemed tighter than usual: I was 20 feet from the stage and found it difficult to advance more than half way. Security was definitely NOT cool for this event. On the small stage, the Stones did It�s Only Rock �n�Roll, Like a Rolling Stone, and then finished with Brown Sugar. While Bobby Keyes did come by to get on stage for the sax part of Brown Sugar, I was surprised the Stones did not use that path to exit. Instead, they walked up the walkway back to the main stage. It was a definite disappointment when the encore was only Jumping Jack Flash, when I saw they did a two song encore in Montreal earlier this week. Arena shows always had two song encores until I noticed just one song being the trend for San Antonio, Nashville, and the MGM. Even if the main show is great, fans deserve that extra song for the money they are paying, and especially if they show enthusiasm. I thought Pittsburgh deserved an additional song tonight, but it was not to be. On a cold and snowy January evening, the Stones appearance definitely improved the world around Pittsburgh. It is a shame that the band did not take the opportunity to go further, with better song selection and an additional encore song. The people of Pittsburgh�s past performance certainly justified this. Hopefully the one song encore will be a thing of the past, as cities like Boston, NY, and Chicago have certainly proven on previous stops that they are worthy of a two song encore. After attending the show at the Mellon Arena, I felt it was a great show. I have seen the Stones in Pittsburgh, in 1989, 94 and 99. Each time that I went they performed fantastic. Last night was no exception. Although I wish that they could have a different song selection. I wish that they would have played, Hand of Fate, Loving Cup, Star Star, or 2000 Man. But, with the set list that they gave Pittsburgh. It was still a strong show. My seats were behind the stage. My view was the left half of the stage. The video screen was too big, I couldn't see Keith or Charlie. Only when Keith came to my side did I see him. The screen should have been smaller. I was glad that the monitors were on to watch. The audience was pumped up for the show. The No Security show in 99 was awesome and the fans were ready. The floor was packed. Of all the shows that I have seen at the Civic Arena. This one by far had the most people packed on it. They were all into it. Despite my view of the stage. I was very pleased by the performance. Although I could have done without Start Me Up. I think it is there most over played song. My wish for a Rolling Stones show is that they would perform a set list without staple, must play songs. With their catalog of recordings in the past 30 years. They could put a set list of rarities on and still bring down the house. At the years go by. I compare the Stones with wine, they get better with age. I was in the second row at this fantastic show performed by the Stones. As indicated earlier, the setlist was similar to previous arena shows on this tour. With Let It Bleed being the album du jour, the Stones cranked out treasured nuggetts like Monkey Man, Live With Me, the title track, a blistering blues intro to Midnight Rambler and the show stopper, Gimme Shelter. Unfortunately, there were some sound problems ( Bobby Keys' sax solo on Can't You Hear Me Knocking was inaudible until Mick "urged" the sound techs to pod up the volume. Keith's guitar intro to the encore Jumpin' Jack Flash did not come through the sound system, only his amp, for about the first three or four chords. Were these guys asleep tonight? The Igloo, as the Mellon Arena is fondly nicknamed for its beloved Penguins NHL team, is a nearly forty-year old arena that is average at best for sound with a very high ceiling and unforgiving echos, much like a domed stadium. The Stones and the sound crew seemed to have solved this problem, but created others. Why was the sound so weak from the b-stage? Anyway, the band appeared to be in good spirits. The highlight for me was catching a copy of the set list from Lisa Fischer. She looks fabulous and her solo on Gimme Shelter shook the forty year old barn to its foundation. Like others who have posted a review, I too, would like to have seen a two song encore with Sympathy as the other number. Alas, we heard Can't You Hear Me Knocking and Midnight Rambler, two numbers that run ten minutes apiece, so our time allottment for the show was up at 125 minutes. 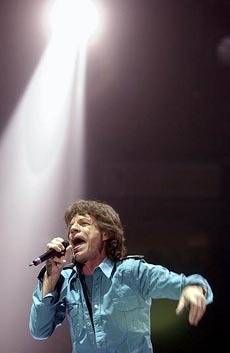 I, like many other fans, have seen the Stones several times on this tour, including Philadelphia and New York. Here's one fan who hopes Mick throws in a few rare treasures for the MSG show on HBO for those of us in attendance (me) and those unfortunate suckers who have to watch it at home. Keep on rockin'! I remember back last year when the tour was announced I knew I would be at this show. This is one of the coolest arena size venues in the entire country for a rock concert. Actually older than the latest incarnation of Madison Square Garden, Mellon Arena (as it's now being called) was built in 1961. It has had very minor renovations since it opened. The hallways look old and dumpy and the seating is seamless with small sections and no suites or boxes. According to Bill Wyman's book "Rolling With The Stones", the band first played here on Nov 24th, 1965. A classic venue for sure not mention the fact that the Stones played what many consider to be one of the best shows of the entire "No Security Tour" here back in '99. After a quick five hour drive I landed in town around 6pm and checked into the hotel which also happened to be where the band was staying. After a nice dinner with some fans and short ride to the arena I was ready for the show! I met many fans who traveled long distances to make it to this show. Most cited this venue as one of the best arenas in the country to see the band....... many put it right up there with MSG and the MGM Grand. I missed Ryan Adams completely as I was still mulling around the box office talking to fans. The Stones hit the stage at 9pm. Right from the opening of Street Fighting Man the crowd was very fired up. People in almost the entire arena stayed standing for most of the show. There was an energy in the crowd that I don't see that often at the arena shows. The band apparently noticed it too and put on a very solid show. It might not have been the ultimate classic show I was looking for but it certainly wasn't for lack of enthusiasm. Highlights of the show for me included Monkey Man, Rambler, and a hilariously botched Let It Bleed where Mick forgot a good portion of the lyrics. The acoustics started out a little muddy but improved alot by the 4th song and it was solid from that point on. My seats were mid level by the b stage and I was pleased with the sound from there. The energy was steadily building leading into the b stage set. Although i'm sick of hearing IORR and I have never really liked them doing LARS, the b stage set was performed perfectly and the crowd was loving it! I never really tire of Brown Sugar and I love it at the end of the b stage set on this tour. Overall a fun, suprising show where the band wasn't at their musical best but their enthusiam, the great crowd, and the classic venue definitely put this show above average. Thanks to Axel Schumacher and H�gne Midjord for links information.